Hawaii's P.J. Owsley put up a shot between Hilo's Samuel Wilhoite, left, and Justin Dobson in the first half last night. Less than a week before its season opener, the Hawaii basketball team didn't want to reveal too much in last night's exhibition game against UH-Hilo. What the Rainbow Warriors did show was enough to roll to an 83-50 win over the Division II Vulcans at the Stan Sheriff Center. With UNLV coaches awaiting the footage of the Rainbows' performance last night in advance of Friday's season opener in Las Vegas, UH coach Riley Wallace limited the playbook for the exhibition. "We didn't run our offense tonight," Wallace said. "We basically won with about a third of our offense, maybe 25 percent." The Rainbows, running two plays in their halfcourt sets, bolted to a 17-2 lead 5 minutes into the game and were never challenged in their rout of the Vulcans. The Rainbows will be back in the gym this afternoon and have four practices to get ready for the game at UNLV on Friday. They return to the Sheriff Center on Nov. 13 for their home opener against Coppin State. "Tonight will get us there a little more and we'll concentrate on the things we have to," Wallace said. About midway through the second half of last night's game, a fan in the crowd of 3,012 (5,037 tickets distributed) hollered "nobody get hurt." And that was among the goals for both teams in the lopsided affair. Wallace substituted freely throughout the game, with the entire roster getting playing time, and got production from both the starting group and the bench. "Everybody got the jitters out, everybody got a look and it was exactly what we wanted out of a scrimmage," Wallace said. 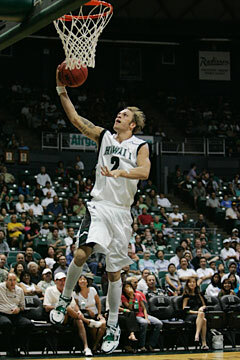 Hawaii's Matt Gibson was all alone as he went to the hoop in the opening half last night against Hilo. Matt Lojeski scored 11 of his game-high 16 points in the first half on 6-for-8 shooting from the field and made two of three attempts beyond the 3-point line. Matt Gibson started at point guard and finished with 10 points, five rebounds and six assists. Forward P.J. Owsley had 10 points and seven rebounds in his debut at the Sheriff Center. "Coach is trying things with rotations and finding out who's going to be doing what and where people are going to fit in and I think we got that accomplished," Gibson said. The Rainbows scored 5 seconds into the game on a layup by Bobby Nash, who fed Stephen Verwers for a dunk less than a minute later, and the Rainbows ran away to a 42-19 halftime lead. The Rainbows ended up shooting 47 percent from the field and had 24 assists on their 34 field goals. "We're starting to get close to where we need to be," Lojeski said. "We might not be there yet, I thought we're progressing though and I see improvement. I think we're getting close." 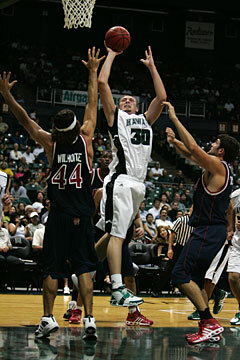 The Rainbows held a significant height advantage over the Vulcans and outrebounded UH-Hilo 50-33. "You can't simulate size," UH-Hilo coach Jeff Law said. "You can stand under the basket with a broom or whatever, it just doesn't mean the same thing. That'll be the tallest team we see all year." Turnovers had been an issue in the 'Bows' preseason scrimmages and they committed 12 last night, just three in the first half. UH-Hilo, which is in the process of replacing four seniors, has considerably more time to address its issues as the Vulcans don't begin their season until Nov. 20 against Lewis & Clark College. The Vulcans shot 5-for-21 in the first half. They were led by Michael Martin's 13 points, while former Kalaheo standout Sam Wilhoite finished with 12 points and eight rebounds. UH-Hilo was without starting point guard Travis Sobers due to academic reasons and Darryl Harris aggravated an ankle injury in the first half. "I was really scared about tonight because I didn't know what to expect," Law said. "The guys played hard, they didn't give up. They did some mental blunders at times, but they continued to play hard for the 40 minutes, so I was pretty happy with that."